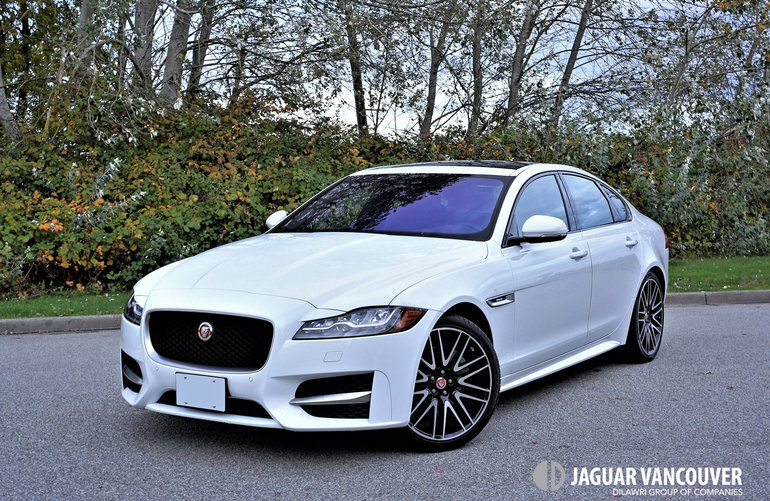 Painted Fuji White and trimmed out in R-Sport guise the Jaguar XF perfectly defines elegant performance, while its 20d turbo-diesel powertrain adds a practical element too. The 20d moniker is new for 2017, giving Jaguar an edge in a market with few competitors. Jaguar is pushing an electric agenda too, its upcoming compact I-Pace five-door crossover making this abundantly clear, but while plug-ins (and hybrids) remain less than one-percent of the global car market while gobbling up immense development resources, the British luxury carmaker, along with its sibling-brand Land Rover, are busy wooing disenfranchised diesel lovers with four-cylinder and V6 diesels of their own. The latter Td6 is used solely by the dedicated SUV brands, while the 20d is an in-house designed and built 2.0-litre four-cylinder that’s as innovative as anything on the market. For starters the Ingenium diesel’s compression ratio is a sizeable 15.5-to-1 thanks to having no spark plugs to trigger the combustion process, the 20d instead utilizing heat generated from air compression to ignite inbound fuel. The result is 180 horsepower at 4,000 rpm and a considerable 318 lb-ft of torque between 1,750 and 2,500 rpm, the latter figures key to the mid-size Jag’s zealous performance. The word “eager” comes to mind, because its 8.4-second jaunt to 100km/h doesn’t accurately explain its vibrant jump off the line and ever-willing zeal to sprint faster by merely feathering the throttle. I’m not trying to compare it to the vim and vigor of the XF’s available gasoline-powered 3.0-litre V6 that puts out an even more engaging 340 horsepower and 332 lb-ft of torque in its most modest state of tune and 40 additional horsepower when an “S” gets added to its nameplate, that last model zipping to 100km/h in just 5.3 seconds, nor for that matter the 2018 model’s impressive new Ingenium 2.0-litre gasoline-powered turbo-four that pushes the car to 100km/h in a mere 5.5 seconds thanks to 296 horsepower and 295 lb-ft of torque, but none of these combine their performance with fuel economy equal to 7.8 L/100km in the city, 5.8 on the highway and 6.9 combined. When not testing the XF’s performance credentials and merely puttering around town doing daily errands I achieved better than the posted limit, my mostly city average resulting in 6.7 L/100km, although my right foot seems to be tied to the wallet in my back pocket which makes for a particularly light touch on the throttle. Either way, the XF 20d is one of few cars I’ve driven that can exceed its claimed fuel economy rating if driven accordingly. When testing the XF’s performance credentials I was hardly surprised by its near unflappable stability and athletic agility. After all, it rides on the same aluminum-intensive monocoque architecture as the F-Type sports car and all other Jaguar models, which means its lighter in weight than most peers, as well as stiffer in structure. This rigidity allows plenty of suspension travel for a wonderfully compliant ride without hampering handling, a best of both worlds combination that can be left to its own devices in Normal mode, adjusted via Jaguar Drive Control settings to eke yet more efficiency from a tank of fuel in Eco mode, aid traction in slippery conditions via Rain/Ice/Snow mode, or better yet, set to Dynamic sport mode to heighten all its senses. The XF comes standard with a fully independent double-wishbone front suspension and an integral-link rear setup that can be upgraded with Jaguar Adaptive Dynamics adjustable dampers, these capable of monitoring body movement 100 times per second and wheel/tire movement 500 times per second while simultaneously comparing data with vehicle speed, lateral Gs, yaw, tire grip, and more. It feeds everything through various algorithms and factors in individually chosen Jaguar Drive Control modes before instantaneously adjusting the damper control valves for ideal ride and handling. It’s a superb system that’s well worth the reasonable $1,020 charge. I should mention that all XF’s use a ZF-sourced, Jaguar-tuned eight-speed automatic gearbox that shifts effortlessly when cruising and snappily when pushed hard, its standard paddle shifters enhancing the latter experience. Like most Jaguars, the pièce de résistance at startup is the rotating shifter that powers up from its otherwise flush position atop the lower console, but after choosing “R”, “D” or “S” any hands-on engagement must be via fingers on paddles. All-wheel drive is also standard across the XF line, aiding grip no matter the road conditions, while All Surface Progress Control provides a sort of low-speed cruise control in slippery situations. Further handling-enhancing torque vectoring comes via the XF’s ABS-enhanced four-wheel discs, while performance-tuned traction and stability control provide very effective failsafe support. Of course, the 255/35ZR Pirelli Cinturato P7s wrapped around big optional 20-inch alloys underneath did their duty and then some, this XF 20d AWD R-Sport a wonder to drive quickly whether tearing up a backcountry road or weaving through inner-city traffic. R-Sport trim would be my personal choice as it adds to the XF’s performance equation both visually and veritably. It gets unique exterior styling details including a sportier front fascia, side sill extensions, plus a rear deck lid spoiler, as well as fabulous satin-chrome trim, gloss black window surrounds, LED headlamps with adaptive cornering and auto high beams, signature daytime running lights, upgraded sport seats, satellite radio, closing vehicle sensing, autonomous emergency braking, blindspot monitoring, reverse traffic detection, lane keeping assist, and a driving condition monitor that sounds an alert if ever dozing while driving. All of this kit gets added to much of the XF Prestige model’s upgrades that include puddle lamps, proximity-sensing keyless access, LED mood lighting, a heatable steering wheel, heatable front seats, four-way powered lumbar support, leather upholstery, navigation, front and rear parking sensors with visual indicators, InControl Apps, etcetera, while the base XF Premium is well equipped with auto on/off headlamps with LED signature lights, branded metal doorsills, pushbutton ignition, an electromechanical parking brake, a universal garage door opener, rain-sensing wipers, genuine aluminum interior inlays, a full-colour TFT multi-information display, an auto-dimming rearview mirror, a powered tilt and telescopic steering column, dual-zone auto climate control, an eight-inch Jaguar InControl Touch infotainment display with a rearview camera, Bluetooth phone and audio streaming, 380-watt 11-speaker Meridian audio, powered front seats with driver-side memory, InControl Protect, InControl Remote, 40/20/40-split rear seatbacks, all the usual active and passive safety equipment, and the list goes on. Pricing starts at $60,000 for 2017, but it should be noted the XF’s MSRP will actually go down to $58,900 for 2018 thanks to a new base 247 horsepower 2.0-litre four-cylinder (which incidentally propels the car to 100km/h in just 6.6 seconds), while my nicely equipped XF 20d AWD R-Sport came in at just over $78k as tested. This is great value when compared to similarly equipped competitors, and as you might expect the XF holds nothing back on its rivals when measuring interior fit and finish, materials quality, and design. The entire dash top of my tester was contrast-stitched padded leather, while Jaguar finishes everything above the waist with soft-touch premium surfaces. In summary, the XF is a superb mid-size sport-luxury sedan that’s as beautiful to look at as it’s entertaining to drive, while when equipped with its ingenious Ingenium four-cylinder turbo-diesel 20d engine it becomes one of the most efficient cars in its class. That it can be had for as little as $60k and gets even more affordable for 2018 is all the more impressive, making the Jaguar XF well worth a closer look when it comes time to trade up from your current ride.